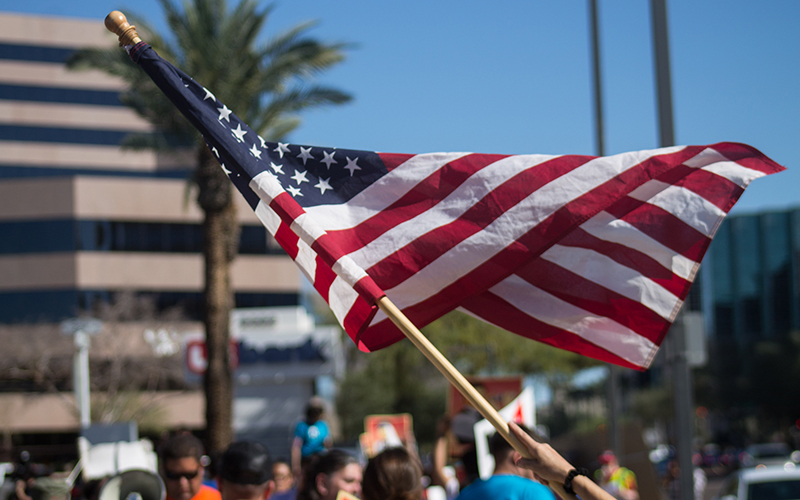 PHOENIX – Supporters of DACA and immigrants with Temporary Protected Status – known as TPS – clashed with an anti-immigrant group at a heated protest outside Sen. Jeff Flake’s office Thursday afternoon. Divided down the middle of the same sidewalk, demonstrators on both sides featured tall signs and handcrafted banners. “Build the wall,” read one. “Stop separating families” read another. 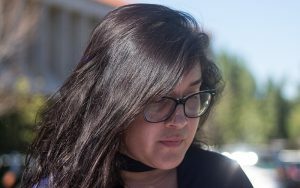 Paola Carrasco, who attended the protest on behalf of the group Living United for Change in Arizona, said picketing outside Flake’s office in the Biltmore area is the only way to draw his attention and the attention of other senators to their cause. “We’re here today holding Senator Flake accountable,” Carrasco said, referring to the budget deal Congress passed early Friday. Senate Republicans promised that a debate on immigration would take place later this month. Flake voted against the budget in the Senate. The deal appropriates almost $400 billion mainly towards military and domestic programs, none of which include financial support for the passing of a DREAM Act. Currently, almost 800,000 immigrants fall under the DACA program, created in 2012 under Barack Obama, allowing people brought to the United States without proper documentation as children the temporary right to live, study and work in the U.S.
Betty Guardado, one of the vice presidents of Unite Here Local 11, a regional chapter of the international union, also expressed disappointed in the government. Guardado said many of the DREAMers and TPS recipients are entitled to rights because they’ve been in this country for most of their lifetimes. “People that have lived here their whole lives, they have established roots here in the United States, and we don’t think that it’s right for them to be stripped down from (their) rights,” she said. Jennifer Harrison, member of Patriot Movement AZ, thinks otherwise. She contends undocumented immigrants should not be a priority in the United States. Although Harrison said she sympathizes with DACA recipients, she believes the parents who brought them here are the ones at fault. “It’s a sad and unfortunate situation they’re in,” Harrison said. “But where are their parents? Why is nobody holding these parents accountable? Marie Mayson, who was born in Cuba and came to the United States legally when she was 5, said immigrants are destructive. “For many, many years illegals have been allowed to come through, destroy our country.” Mayson said. “They have destroyed city after city after city.”. Mayson said undocumented immigrants need to respect this country and President Donald Trump.